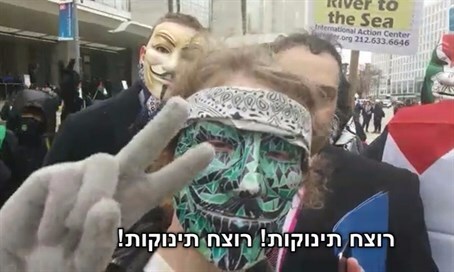 Watch: Anti-Israel protesters confront Arutz Sheva crew outside the AIPAC conference. Protester blames Israel "killing babies"
A group of pro-Palestinian Arab activists on Sunday interrupted Arutz Sheva's crew as they were reporting from the protest outside the AIPAC policy conference, blaming Israel and Arutz Sheva for “killing babies”. The masked protesters claimed they were from the Anonymous group of hackers and said they came to protest outside the conference “to support Palestine”.